Preparations for Mars mission – ongoing. Hoping for rain – always. Missing her best friend – must cut that memory off. Entirely. Find this March 2017 release at your local library or favorite independent bookstore to see how Ish’s applications to the Mars Now program are received. When your best friend moves away, what next? Book info: Love, Ish / Karen Rivers. Algonquin Young Readers, 2017. [author site] [publisher site] Review copy and cover image courtesy of the publisher. My book talk: Certain that she will someday be selected for a Mars mission, 12 year old Ish lists everything that she’ll miss about Earth, like former best friend Tig and the island on their drying-up California lake, and what she won’t miss, like how Tig never calls from Oregon and the cancer that started hurting her brain and how her sister hates her. No denying that starting seventh grade is terrible without Tig here, or that Ish was surely adopted with cute older sister Elliott because they were a package deal. No good reason that Mars Now has rejected Mischa Love’s application 47 times, or that new friend Gavriel can’t be a girl if he wants to be. A brain tumor the size of a brussels sprout – not Ish’s favorite vegetable. Radiation treatments – Ish doesn’t like her red hair, but she doesn’t like it falling out either. Dreams of Mars, all the dreams – never let them stop! in space at age 12! 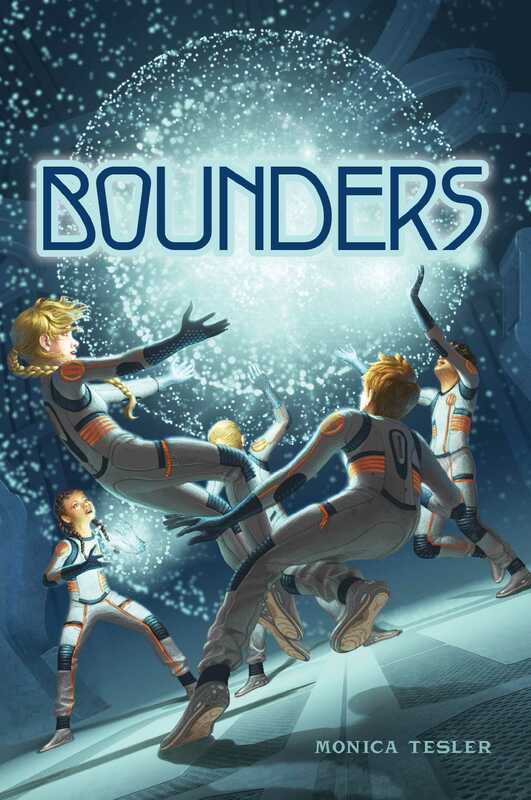 Bred especially to be Bounders, Jasper and other 12-year-olds find themselves grudgingly assisted at Earth Force Academy and challenged to master the alien-shared tech needed to bound, but why exactly the military Earth Force decided that young teens with ‘unusual neurodiversity‘ were the best pilots for this alien world-jumping is rather… suspect. Book info: Bounders / Monica Tesler. Aladdin, 2016. [author site] [publisher site] Review copy and cover image courtesy of the publisher. My book talk: Genetically specialized for interstellar ship bounding, 12-year-old Jasper is glad to escape earth-school bullies and learn to use alien quantum tech at the Academy in space, but he and his pod-mates start wondering why they were bred to become quantum pilots for the military…. William Shakespeare’s The Phantom of Menace, by Ian Doertcher (book review) – May the Force be with thee! Can heroes rise ‘gainst Federation’s sway? Whose patriots do try, do fight, do die. Queen Amidala finds a strong ally. Seek out this so-readable retelling of Star Wars: Episode One at your local library or independent bookstore – ’twas published mere weeks ago. Why note it not upon its natal day? And may the Force be with us all, I pray! post scriptum – Verily I say, forthcoming and much-anticipated are part two The Clone Army Attacketh in July 2015 and part three Tragedy of the Sith’s Revenge in September 2015.
post-post scriptum – Mine thoughts on earlier-released parts of this series? Look ye here: William Shakespeare’s Star Wars (part 4), The Empire Striketh Back (part 5), and The Jedi Doth Return (part 6). 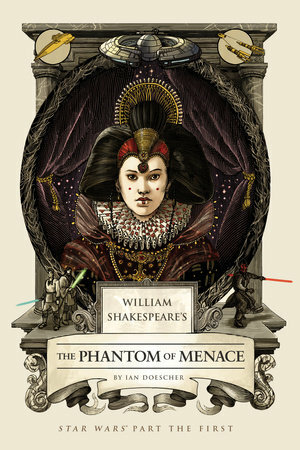 Book info: William Shakespeare’s The Phantom of Menace (Star Wars, Part the First) / Ian Doescher. Quirk Books, 2015. [author site] [publisher site] Review copy and cover image courtesy of the publisher. My book talk: In the very style of Shakespeare comes this peril-laden tale of Star Wars’ early days as The Phantom of Menace relays the fall of the Republic, the rise of Anakin, and much swordplay, speeder racing, and treachery. To all the bosses; thus my banishment. Yet this is not the story I’ll relate. The young queen’s masquerade as her own maid, the fortuitious finding of Anakin Skywalker and arguments among the Jedi about training him (Yoda speaks in haiku), romance cut short, and enemies growing stronger – it’s all here. Did you read every BooksYALove recommendation this summer? No? 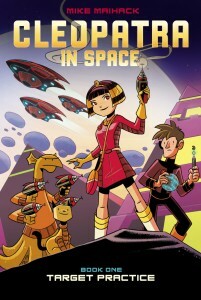 Target Practice, by Mike Maihack – Great combo in this graphic novel with talking cats, aliens, and the Queen of the Nile as a curious teen. 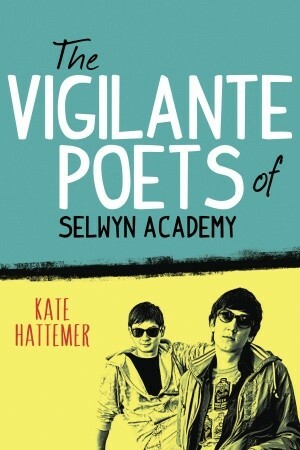 Kate Hattemer’s Vigilante Poets of Selwyn Academy pits those who think “For Art’s Sake” reality show is their path to success against the kids who think it’s ruining their school. Remember that you still have time to enter the free giveaway for an autographed copy of The Green Teen Cookbook from Zest Books. Go to my original recommendation here and comment by 11:59 pm Central Daylight Time on Sunday, 31 August 2014 to be entered. I’ll toss all the comments into Randomizer when I get back from #IASL2014 in Moscow, and we’ll see who the lucky winner is! p.s. Do either of these schools resemble yours? Red Rising, by Pierce Brown (book review) – class warfare on Mars, to the death! Love adds fuel to vengeance! Game of Thrones meets Star Wars and Hunger Games on the Red Planet in this rock ’em, sock ’em story, as lowest-caste Darrow is completely remade so that he can win the ultimate competition among ruling class youth and free his family and friends from slavery in the mines of Mars. Be sure to visit the publisher’s site and click More Inside to read the first chapters so you know how the injustices heaped upon the Reds for generations have forged Darrow into a weapon. 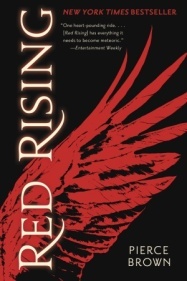 Book info: Red Rising (Red Rising Trilogy #1) / Pierce Brown. Del Ray Spectra, 2014. [author site] [series site] [publisher site] [book trailer] Review copy and cover image courtesy of the publisher. My book talk: A quest for vengeance drives Darrow to escape slavery in Mars’ mines and beat the Gold overlords at their own game as they fight to the death for power. Deep in its hellish mines, Reds have slaved for decades so the Martian surface can become habitable, little knowing that the Red Planet is already a world of luxury. When his young wife is executed for singing the forbidden death dirge, 16 year old Darrow’s rage makes him a perfect target for the Sons of Ares, fellow Reds who’re willing to rebel against the ruling Golds – from the inside. Darrow is remade – bones re-engineered to sustain maximum impact, brain retooled for intellectual superiority, reflexes honed to matchless fighting ferocity – and enters the Institute where young Golds compete to become supreme rulers in the Solar Systems where the “noble lie of demokracy” has been stamped out. All the Reds will stay enslaved if he doesn’t survive this vicious months’ long war against teens of the various Institute houses battling for the choicest apprenticeships of power, truly battling to the death. A master strategist, a true leader, a Red in Gold’s skin, Darrow intends to win at all costs and to change society from the top down to the helldivers’ mines in this first book of the Red Rising trilogy.